Great bag for summer fun. 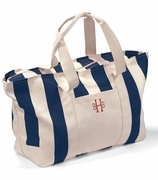 Be the first to sport this nautical look large boat tote to the resort, beach or pool. Lightweight cotton canvas blend with rope handles. Includes single letter, name or three letter monogram. NOTE... R & R Cancun 2015 was a special order embroidery. INDIVIDUAL BAGS WILL BE STITCHED IN THE ALISON FONT. Huge beach tote measures 22�W x 14�H x eight inches across bottom. Magnetic snap closure. I was very happy with this bag. It is extremely nice and looks extremely durable.